I was sorting through my closet the other day switching things around for the warmer weather. It occurred to me that I really have 3 sizes of clothes: Pre-baby, Maternity, and Post-baby. Since my closet is very small I obviously can't keep it all in there. I share maternity clothes with my younger sister so that is all packed in a big box for the next person to use. I sorted the rest of my clothes in to larger and smaller sizes, then figured out what size I am now. HURRAY to me I am into my smaller clothes again! So away went my larger things to the back of the closet. I am excited now with what I have left because I won't be searching for to long to find something that I can wear and that will fit. 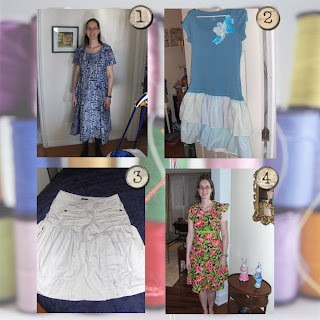 I have also been refashioning a lot of the clothes in my give-away pile to give them new life and save me money. I really was going to do one post about my wardrobe once I was finished, but I have discovered that this is an ongoing project. Here are the most recent clothes I have made for myself. I'll just keep posting as I make more. I'll also learn to model my clothes better or teach my hubby to take some more flattering photos! 1. Simplicity 5189 pattern made with material from Africa. 2. t-shirt, bed sheets, curtain dress refashion. 3. two pairs of khaki shorts made into a skirt. 4. Same Simplicity pattern with a variation. Here are some more pictures of my latest skirt. I made it by combining two pairs of khaki capris. I've got lots more ideas so I'll post them soon. What have you made for yourself?